From us, global buyers can avail the Shell and Tube Heat Exchangers in different grades and specifications. 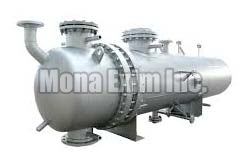 We are the noteworthy Shell and Tube Heat Exchanger Manufacturer, Supplier and Exporter from Maharashtra, India. Engineered as per global standards, these Heat Exchangers are deeply appreciated for their innovative design and peerless performance for a long span. Place order with us for discounted prices and on-time delivery!